Peter Lombard (born in Lombardy), was a student and then teacher in Paris, where he became archbishop shortly before his death in 1160. He wrote a number of commentaries and theological works in the 1140s-1150s, including this commentary of the New Testament letters of St. Paul, which became a standard text throughout the rest of the Middle Ages. 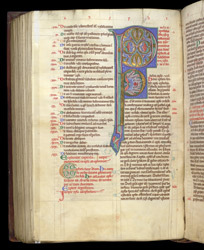 Chapter lists, like the one filling most of the left-hand column here, are a common feature of 12th-century Bibles and biblical commentaries. They allow a reader to quickly find the section they want by reading the list of contents at the start of each biblical book, and then using the numbers in red roman numerals to turn directly to the relevant chapter.